I just want to say that my first thought was to pay respect to the victims of the Paris Attacks and their loved ones by vowing to be silent on my blog for today, but I do want to say that my prayers go out to all those who have been affected. Of course the investigation is ongoing but it’s rumored that ISIS (the deplorable and nefarious Syrian terrorist group) is laying claim that they’re responsible for the bombings and shootings. Whoever it is, I hope that all the monsters that caused this world tragedy get what’s coming to them. Any act of terrorism in any shape or form is despicable and unforgivable; acts of war should never be committed on innocent citizens. 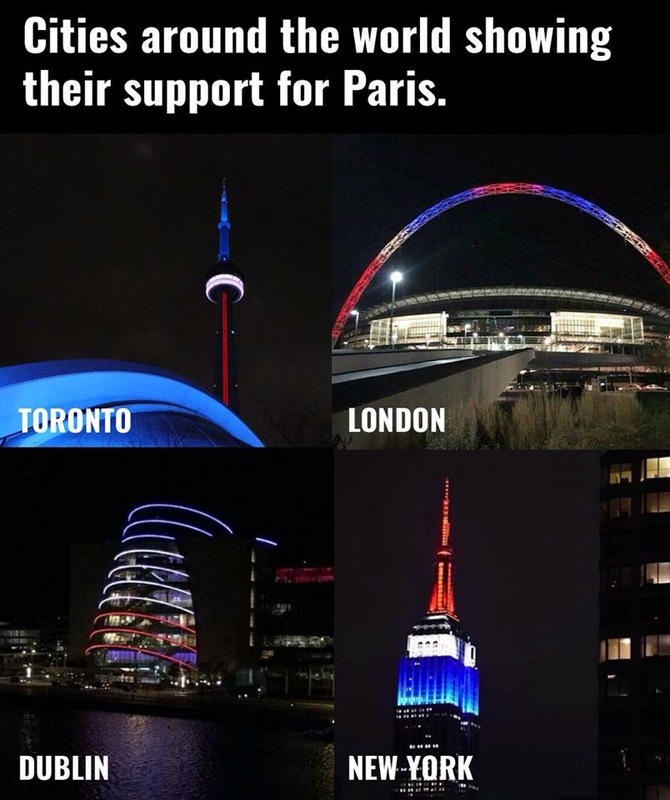 I’m just heartened by the fact that so many people around the world have already began to show their support for the victims and for the whole of Paris and France. The fact that people can set aside their differences and still stand together after something as devastating as this is magical, and will no doubt give the victims in Paris to push ahead and overcome this travesty. I can’t speak for all of America but the United States wouldn’t be if the French hadn’t assisted us in the American Revolution, and I recall correctly, Paris sported a large American flag very near their iconic Eiffel Tower following the 9/11 attacks, so the least that we can do as citizens of this country, and as members of humanity, is support the victims and their families after this irreplaceable loss of life. We are all human, English or French, black or white, religious or not, and we should all love and value each other’s well-being. I will honor Paris with a physical moment of silence while doing whatever I can to support otherwise (and I urge others to do so as well). L’anour est comme le vent, nous ne savons pas d’ou il vient. Den største indflydelse på prisen på din boligalarm er dog, om du vælger at få en boligalarm med eller uden abonnement.